classification tool that will allow us to link the drivers to the KM strategies, using a number of ... the best definition of knowledge management in a given situation, a very broad ..... The community view emphasises knowledge as socially. Entrepreneurial Business and Economics Review,. 2(4), 101-112, .... construction works in commercial objects, trends, legal issues and available construction. 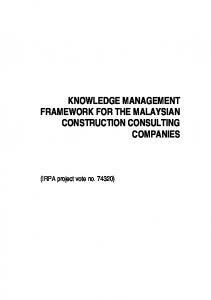 1.6 THE CONSTRUCTION CONSULTING COMPANIES IN MALAYSIA: AN OVERVIEW .... Management writes, âThose companies that develop best practices for ...... these devices may also include personal or laptop computers as the tools for. Contents of KM for SOCs: facilitator-led knowledge stream. 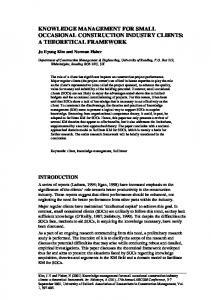 Sharn and Sharn (1997) argue that knowledge creation or acquisition requires the repetition of act(s). Mar 21, 2006 - Mustafa Alshawi & Jack Steven Goulding: University of Salford, UK .... for their instructional use has yet to emergeâ (McGee, 2003), and the. May 29, 2015 - churches, schools and universities (Maasdorp, 2001: 3). The second category is ...... Address at the University of Stellenbosch Business School. Knowledge Management (KM) became a new concept of organizational ... strategi knowledge management dalam penerapan KM di pemerintah Indonesia. 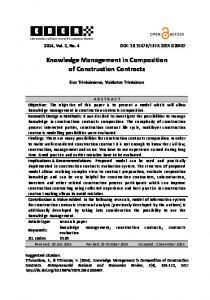 KNOWLEDGE MANAGEMENT STRATEGY FOR CONSTRUCTION: KEY I. T. AND CONTEXTUAL ISSUES Patricia M. Carrillo, Chimay J. Anumba, John M. Kamara Department of Civil and Building Engineering, Loughborough University. ABSTRACT: Most business organisations often cite the staff as their greatest asset but have not appropriate mechanisms for managing the knowledge or intellectual capital that is embodied in these staff. The importance of Knowledge Management is now being realised and businesses are starting to formulate strategies and to invest in systems that will enable them to manage their corporate knowledge. This is a relatively new concept for construction organisations, which have a fundamental need to manage knowledge as they move from one project to another, working with different partners and supply chains. This paper examines the information technology (IT) and contextual issues involved in formulating an appropriate knowledge management strategy for construction firms. Basic definitions of knowledge and knowledge management are provided. Insights from ongoing research are used to discuss the context for knowledge management in construction, and the role of information technology (IT) as an enabler for knowledge management. The concluding section of the paper formulates guidelines that will enable construction organisations to more appropriately develop IT and knowledge management strategies that will enable them to improve their business performance. Figure 1. 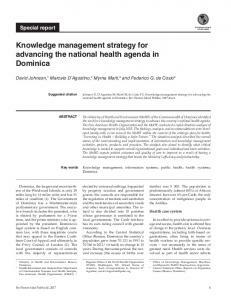 Conceptual framework for knowledge management. The 'knowledge base' refers to the kind of information, data or project knowledge that is to be managed. 'Knowledge management processes' refer to the tasks and activities that are implemented to manage knowledge, within the context of the project and/or organisation ('process shaping factors'). 'Performance measurement' deals with the assessment of the realtime usefulness of knowledge management efforts, since KM is not an end in itself, but a means to add value and increase competitive advantage. This paper focuses on the contextual issues (process shaping factors in Fig. 1) and the tools (particularly IT tools) for a knowledge management strategy in construction. A discussion of the organisational context for KM in construction now follows. Consider appointing a champion; Talk to front-line staff and find out what information they need for their work; Allocate adequate resources (financial and non-financial) for a prototype; Start with a small problem which relies on in-house knowledge before moving onto large projects involving the supply chain; Map out clearly the methodology for the knowledge lifecycle from capturing data to knowledge retirement; Identify a strategy for dealing with obstacles such as limited time and data validation; Evaluate progress and obtain feedback from front-line staff on a regular basis; and Review the strategy and achievements periodically for possible revision. those for capturing and codifying knowledge (artificial intelligence system): these provide organisations and managers with codified knowledge that can be reused by others in the organisation. Within the construction industry, there are now a variety of systems that facilitate the knowledge creation process. These are usually discipline-specific and include CAD systems, analysis systems, estimating systems, etc. Increasingly, these systems are being integrated both within and across disciplines, thereby facilitating the flow of information. 4.1.2 Systems for knowledge processing These are systems that Laudon and Laudon (1998) term ‘office automation systems’. They enable the processing manipulation (storage, etc) of knowledge in an organisation and include, amongst others, word processors, spreadsheets, desktop publishing systems and databases. These systems are now routinely used within construction organisations to ensure the smooth running of businesses. 4.1.3 Systems for knowledge sharing Knowledge sharing systems are utilised to support groups working together such that members of the group can share data, information and knowledge within a given context. Examples of these systems are intranets and other groupware systems such as videoconferencing, document management systems, bulletin boards, shared databases, electronic mail systems, etc. The use of these systems is growing in the construction industry but, so far, the emphasis has been more on supporting intra-organisation groups rather than virtual project teams that have members drawn from several organisations. This is expected to change. 4.1.4 Systems for knowledge capture and codification Systems that are able to encapsulate knowledge and expertise in coded or symbolic form are vital for knowledge management in an organisation. They enable the setting up and maintenance of knowledge bases that preserve knowledge/expertise that might otherwise be lost when a key member of staff is no longer available. These systems are generally based on the concept of ‘artificial intelligence’, (AI) and are effective decision support systems. The uptake of AI systems in construction has been disappointing and is partly attributed to the hype associated with ‘expert systems’ in the eighties. However, there is renewed interest and AI systems are increasingly embedded as components of larger IT systems. 4.2 Requirements of a KM system For any IT system to be classified as a Knowledge Management system, it must fulfil a number of requirements: 1. 2. 3. 4. 5. 6. It must support the full KM lifecycle – from knowledge creation through distribution and management to retirement – and not just a subset thereof. There should be appropriate mechanisms for validation and authentication of the knowledge encapsulated in the system (Kamara et al, 2000). The system should be able to seamlessly integrate with existing legacy IT systems within a real or virtual organisation. Flexibility and ease of use are essential components of the system, as they are crucial for ensuring its acceptability and utilisation. The knowledge contained within the system must be well maintained and up-to-date. This is essential for building up user confidence in the system and ensuring that decisions are based on the latest information available. The system must be designed in accordance with an organisation’s goals, culture and business processes. End-user involvement in the design and implementation of the system is crucial in this regard. The above list of requirements is not exhaustive but is indicative of the key issues in the development of IT systems to support knowledge management in an organisation. recognise the importance of harnessing and managing their knowledge resources; formulate a KM strategy that is proactive and has built-in mechanisms for ensuring that it results in improved business performance; understand the impact of KM on the organisational structure and working practices of a real or virtual organisation; develop appropriate strategies for overcoming the cultural and other barriers that inhibit knowledge management. For example, it may be necessary to implement incentive/reward systems that encourage people to share knowledge; view IT as an enabler, which should be part of an integral multi-faceted KM strategy; develop and implement an IT infrastructure for KM which is tailored to suit the needs of the organisation; implement an appropriate training programme that educates the organisations employees on the benefits of KM, and in the use of any supporting IT systems. In conclusion, it is important to state that knowledge management is not an end in itself and is of limited value if it is not geared towards improved business performance. Construction organisations need to better manage their knowledge assets if they are to remain competitive in the new Millennium. This paper has set out the key IT and contextual issues that need to be addressed in this regard. REFERENCES Aaker, D. (1984). Developing Business Strategies, John Wiley & Sons, New York. Anumba, C.J., D. Bloomfield, D., I. Faraj, I. and P. Jarvis (2000). Managing Your Knowledge Assets: Knowledge Based Decision Support Techniques for the Construction Industry, BR 382, Construction Research Communications Ltd. Ashworth, A. (1991). Contractual Procedures in the Construction Industry (2nd Edition), Longman, London. Baxter, L. F. and A.W. Macfarlane (1992). Just In Time for the Construction Industry, CIOB Construction Papers, No. 14, The Chartered Institute of Building, UK. Bennett, J. and S. Jayes, (1998). The Seven Pillars of Partnering, Thomas Telford Publishing, London. Blumentritt, R. and R. Johnston (1999). 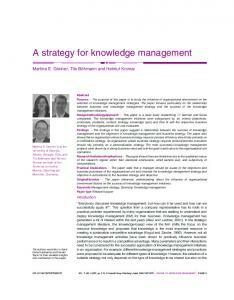 Towards a Strategy for Knowledge Management., Technology Analysis and Strategic Management, 11 (3): 287-300. Boseman, G. and A. Phatak (1989). Strategic Management – Text and Cases, John Wiley & Sons, New York. British Property Federation (BPF) (1983). The British Property Federation System for the Design of Buildings, British Property Federation, UK. Cannon, J.T. (1968). Business Strategy Policy, Harcourt, Brace and World, New York. Construction Productivity Network (CPN) (2000). Applying Knowledge Management to the Construction Industry. Workshop held, London 13th Jan. Davenport, T. (1997). "Secrets of Successful Knowlegde Management", Knowledge Inc. 2, February. Drucker, P. (1993). Post-Capitalist Society. Oxford, Butterworth-Heinemann. Egan, J. (1998). Rethinking Construction. Report of the Construction Task Force on the Scope for Improving the Quality and Efficiency of UK Construction, Department of the Environment, Transport and the Regions, London. Egbu, C., J. Sturgesand, and B. Bates (1999). Learning from Knowledge Management and Trans-Organisational Innovations in Diverse Project Management Environments., W. P. Hughes (ed. ), Proceedings of the 15 Annual Conference of the Association of Researchers in Construction Management (ARCOM), Liverpool John Moores University, Liverpool, 15-17 September, pp. 95-103. Egbu, C. (2000), "The Tole of Information Technology in Strategic Knowledge Management and its Potential in the Construction Industry", in Faraj, I and Amor, B. (eds. ), Proceedings of the UK National Conference on Objects and Integration for Architecture, Engineering and Construction, 13-14 March, Building Research Establishment Ltd., pp. 106-114. Evbuomwan, N. F. O. and C. J. Anumba, 1996. Towards an Integrated Engineering Design Environment, in B. Kumar & A. Retik, (eds. ), Information Representation and Delivery in Civil and Structural Engineering, Civil-Comp Press, Edinburgh, pp. 127-134. Grundin, J. (1995). Why Groupware Applications Fail: Problems in Design and Evaluation., in R. Baecker, et. al. (eds. ), Readings in Human-Computer Interaction: Toward the Year 2000, Morgan Kauffman. Hellard, R. B. (1993). Total Quality in Construction Projects, Thomas Telford, London. Howard, H. C., R. E. Lewitt, B. C. Paulson, J. G. Pohl, and C. B. Tatum (1989). Computer Integration: Reducing Fragmentation in AEC Industry, Journal of Computing in Civil Engineering, ASCE 3 (1): 18-32. Kamara, J. M., C.J. Anumba and P.M. Carrillo (2000). 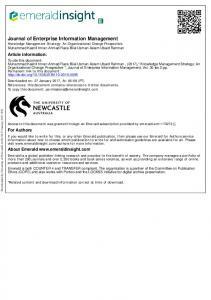 “Integration of Knowledge Management within Construction Business Processes” in Faraj, I and Amor, B. (eds. ), Proceedings of the UK National Conference on Objects and Integration for Architecture, Engineering and Construction, 13-14 March, Building Research Establishment Ltd., pp. 95-105. Kaplan, R.S. and D.P. Norton (1996). The Balanced Scorecard, Harvard Business School, Boston. Kazi, A. S., M. Hannus, and C. Charoenngam (1999). 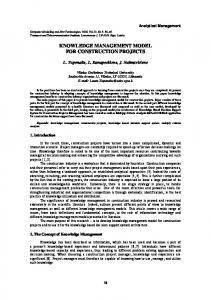 An Exploration of Knowledge Management for Construction., in M. Hannus et al. (eds. ), Proceedings of the 2nd International Conference on CE in Construction (CIB Publication 236), Espoo, Finland, 25-27 August, pp. 247-.256. Latham, M. (1994). Constructing the Team. Final Report on Joint Review of Procurement and Contractual Arrangements in the UK Construction Industry, HMSO, London, UK. Laudon, K. C. & P. L. Laudon, 1998. Management Information Systems, Fourth edition, Prentice-Hall, New Jersey, USA. Miyatake, Y. and R. Kangari (1993). Experiencing Computer Integrated Construction., Journal of Construction Engineering and Management, ASCE, 119 (2): 307-322. Nonaka, I. and H. Takeuchi (1995). The Knowledge Creating Company, Oxford, Oxford University Press. Rennie, M. (1999). “Accounting for Knowledge Assets: Do we need a new Financial Statement?”, International Journal of Technology Management, 18(5/6/7/8), 648-659. Scarbrough, H. and J. Swan (1999). Case Studies in Knowledge Management. Institute of Personnel Development, London. Siemieniuch, C. E. & M. A. Sinclair (1993). Implications of CE for Organisational Knowledge and Structure - A European, Ergonomics Perspective, Journal of Design and Manufacturing, 3 (3):189-200. Siemieniuch, C. E. & M. A. Sinclair (2000). Aspects of Knowledge Lifecycle Management in Manufacturing Industry, and their Implications for Organisational Configurations., Forthcoming in International Journal of Human-Computer Studies. Stewart, T. A. ( 1997). Intellectual Capital: The New Wealth of Organisations, New York, Doubleday. Webb, S. P. (1998). Knowledge Management: Linchpin of Change, The Association for Information Management (ASLIB), London. Report "knowledge management strategy for construction - CiteSeerX"